Sani Kukasheka Usman, Abuja: As part of the activities marking the Nigerian Army Day Celebrations (NADCEL) 2016, troops involved in live field training exercise code named “Exercise HARBIN KUNAMA”, have intensified patrol of the various forests in Zamfara State. It is in line with that troops of 223 Battalion while on patrol encountered armed bandits at Madaka village, Maru Local Government Area in which they killed 9 armed bandits and recovered 3 AK-47 rifles, 2 AK-47 rifles magazine, 3 rounds of 7.62mm (Special) ammunition, 1 machete and 24 motorcycles. Similarly, local vigilantes at ‘Yargada village, Gusau Local Government Area apprehended a fleeing suspected armed bandit and handed him over to troops deployed at Manami. 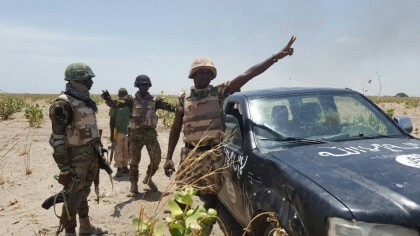 In a related development, troops have also raided a bandit camp at Gangamai village in Dansadau Local Government Area. During the raid there was an exchange of fire between the troops and the armed bandits. Unfortunately, the bandits escaped with gun shot wounds. However, the troops recovered 2 Dane Guns bags containing marijuana (aka Indian hemp). Another team also carried out raid on cattle rustlers and armed bandits camp at Gidan Mai Jaja in Dansadau general area. Here, the rustlers and armed bandits fled on sighting the approaching troops abandoning 85 cows, 37 sheep and a donkey. Similarly, another patrol team also carried out a raid on a armed bandits and cattle rustlers camp at Gobirawan Kwacha where they killed 2 armed bandits and recovered a machete.